Michal Šeba is a Prague-based photographer and musician. The unlikely start of his musical career happened in a reggae dub band, followed by electronics, culminating in his current project ACUO, with which he also participates in SHAPE. 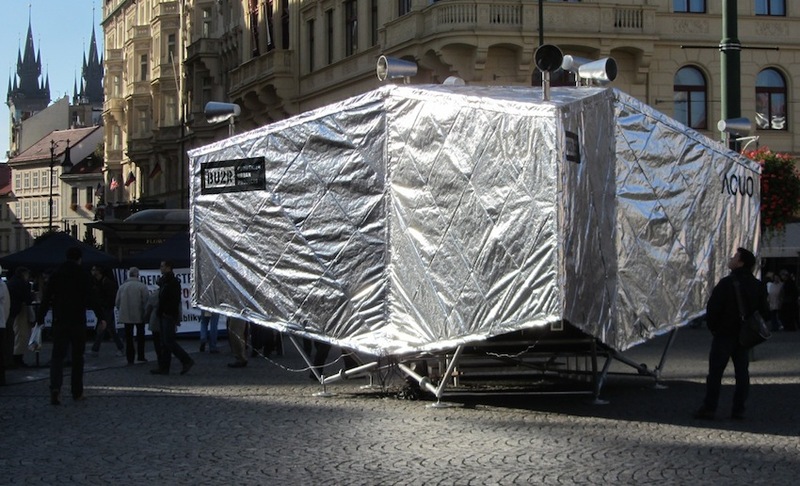 A Gesamtkunstwerk, encompassing architecture, installation, psychogeography, sound design and music, ACUO aims to create a temporary autonomous zone in cities, filtering their cacophonous sounds into “space music” experienced within the confines of a silver “spacecraft”. He was nominated for SHAPE by MeetFactory. Can you introduce yourself and describe your activities? Michal Šeba: I’m a photographer, I studied at the University of Art, Architecture and Design at its Photography Department in Prague. I had been doing a lot of music before I went to university. I had an electronic music project called Data Live, then I started ACUO, which is a mixture of sound, design, music, architecture and installation. Thanks to this project I also became a music producer. What led you to active participation in the world of music? MS: I first started playing the piano as a boy. In 1997 I began to play in a band called Funtasy Milk, a relatively well-known band in Prague and the Czech Republic. We focused heavily on electronic music, but we didn’t have the equipment, as it was impossible to get good computers at that time. We did instrumental music which sounded like electronic, the drummer played jungle rhythms, a lot of reggae dub. Around 2002, the band split into several other projects, and one of them was Data Live, which I set up together with the leader of Funtasy Milk, Stanislav Abrahám, who is also involved in SHAPE. We started to buy equipment, synths, effects, and learn about computer music. How did your project ACUO come to life? Were you always interested in urban sonics? MS: I’ve always been a listener. I have an ability to hear very high frequencies, which sometimes can get annoying. Once I went to see an ear doctor and I broke a record with being able to hear very high frequencies. I love bass, because it sounds very clear to me. I’ve always listened to music and sounds of nature. I did a lot of landscape work in my photography work as well, it was like a meditation. I was very surprised once when I was driving with my sister in the car, and she was listening to some crappy radio stations. I was listening to the songs, and mentioned that the bassline of the song was nice. And she asked me what a bassline was. I realised that some people listen to music as a whole, which for me is impossible. I envy them this ability to hear a song as one unified thing. I’m always dissecting different sounds and hearing them separately, liking some, but disliking other parts. I thought about it a lot. You stand in a square in the city centre and have millions of sounds around you but you can only focus on one of them. There is a bird. There is this tick-tack rhythmical sound of the street crossing, birds, the police siren passing by. Everyone is yelling and shouting. It’s almost like music. I developed this idea to enclose the sound into a single space which would be situated in the middle of a city, people could come in and focus on what is around them because they are starting to be deaf to the sounds that surround them. One day, a blind woman who visited the installation was very thankful saying that this is how they listen to sounds. ACUO has six microphones so it was all the way in the sphere, and inside there are six speakers. You can walk around, but actually still be on the square and listen to sounds. We also listened to the sounds without the effects and were satisfied. Though the basic idea was to turn it into some kind of space music by putting a lot of different effects on the sounds – from resonators through delays and reverbs – to make it rhythmical and sonically interesting. Could you describe the set-up and the specifics of the project? MS: ACUO is an installation on a square, which looks a bit like a spacecraft that has landed and came to observe the sound and the view of the place. It also has sophisticated legs, and a silver house, which is built in the shape of a star with three peaks. It has six microphones on the roof, and a seventh, very large microphone, a sort of a periscope. People can come inside into a soundless chamber and listen to the city in a very nice way as if they were in space. On the walls, there are LED diodes, which display the surroundings in a pixelated way. If someone passes ACUO, it looks as if a shadow passed. ACUO has three cameras outside as well, plus an FM transmitter, an antenna. In Prague it had its own FM frequency, so people could listen to it on their radios in stereo. We developed the idea with ACUO Silent Concerts. We invited three very good Czech singers, Dan Bárta, Lenka Dusilová and Ondřej Havlík, a very good beatboxer and singer. They made music right there on the square using sequencers and loop samplers. People who came and brought their radios could listen to the music, otherwise they could only here tones or just a part of the rhythm. It was very interesting to see Japanese tourists passing by and not knowing what’s going on, Czech people giving them their headphones and seeing their surprised reactions. We started the concert at 10pm, the “silent hour” in the Czech Republic, when everything goes quiet by law. ACUO also has more versions. Can you talk about each? MS: During summer 2012 we travelled around the Czech Republic recording all the interesting places. For instance, we found a company that makes huge iron equipment for trains, then we went to the countryside and recorded the sound of birds flying from their winter homes to the lakes of South Bohemia. We gathered 12 recordings of cities and landscapes and then found producers and bands to remix it. This was later released under the name ACUO Urban Symphony. It was very successful. The CD started with the real sound of a place – 8 to 10 seconds long – and right after that followed the remix. We were thinking to take this project abroad, find a country and local producers and musicians who could do the remixes. We also have other ideas, like connecting sounds to google maps, or develop an application where people could get together via the sound or record the sound and make a website. Does Prague have a specific sonic genius loci? MS: Prague, as any other city, has an idiosyncratic sound. There is a lot of traffic, you can hear cars driving over the stones, because in Prague there are these little streets made out of stone from a very long past. That’s a special sound, because other cities are trying to make the traffic as quiet as possible, in Prague, this is not the case. The traffic lights have these very fast clicks indicating when people have to cross the street, the low tempo clicks are for stopping and standing, the fast tempo is for crossing. Prague is a city of hundred spires, each of them has a bell, the sound of the bells is omnipresent. Also, similarly to other cities in Europe, on the first Wednesday of the month, we have a siren test, which is also very interesting. I always go out and listen to it. I love the part of the river, where you can hear the birds, the river, the space. The last four or five years, people have started to rediscover the river again. And what about Prague’s music scene? MS: I think it’s great. There are lot of projects either in art or photography, that are unknown. Prague is really still just a “start-up” in terms of art and music. It is getting better and better each year. I think there are a lot of very good projects in Prague, like Lenka Dusilová. There are also lot of very good electronic projects. I think Czech people in general are good musicians. They have music in their blood, but are shy about it. When they get drunk, they start to sing and they are good at it. They have a rhythm and there’s more inside of them than they think. Is ACUO and on-going project? Are you still recording sounds? MS: The first idea was to build the installation, the ACUO “spacecraft”, start in Prague and then go to the other main cities in the Czech Republic and maybe abroad. In the end we found out that we made a mistake with its shape, which is very nice, very artistic in an architectural way, but very hard to transport. We had a sponsor and they decided not to fund the transport of ACUO anymore. This year, ACUO will be present in Pilsen, the European Capital of Culture. What about your future, are you going to do more visual or musical projects? MS: To be honest, I don’t think a lot about future. I focus on the present. I have ideas for photography and visual arts, installations. I’d also love to continue with ACUO. Everything depends on the funding, and this is the part that’s the hardest in the Czech Republic. It is very low. What about in your visual work, do you also perceive your work in a structuralist way? MS: I always hear the sound of the place where I’m shooting and can remember it. I usually spend about two hours in the place where I take a picture. Sometimes I revisit the place because I’m not satisfied with the results. I’m also thinking a lot about the visualisation of the sounds and the surroundings. A well known Czech artist Arne Hošek “painted” music. He listened to music and made a painting about it. I’m very interested in this. MS: Yes. I’m working with video, also within the commercial realm. One ad I did was based on a rhythm, but there was no music, only sounds of nature, horses and animals. Everything was based on editing to make it into a musical, rhythmical piece. I have some ideas to make videos based on editing which in the end create a rhythmical base for the sounds.